Laundry in a house with six people is quite a job! Just one outfit per day, per person makes a large pile. Add sheets and towels, workout clothes, sports practice clothes and uniforms, swimsuits and those giant beach towels – WOW! There are, I’m sure, many laundry theories. 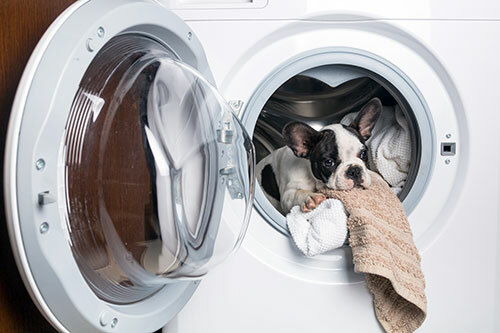 The two most common are the once-a-week-laundry-day and the do-laundry-daily methods. Once a week laundry is fine if you’re ok with committing an entire day (or two) to washing, drying, folding, hanging, and putting away. In my house this method might not be terrible if I had two sets of machines – dare to dream. Family members place their dirty items into one main laundry basket. Items are sorted into tall, square pop-up mesh laundry hampers (undies/socks, light colors, dark colors, towels, etc). These mesh laundry hampers conveniently hold just the right amount of clothing to fill my front-load washing machine! Each morning I put the fullest sorter into the washer. During the school year, this happens right before I wake the kids. Just after dropping the kids at school, I switch the washed load to the dryer and usually put a second load into the washer. Managing one or two loads of laundry per day, every day, keeps our laundry under control. When I take a weekend off, I do three loads on Monday and Tuesday. As for my theory on what happens after things leave the dryer, most items are folded or hung as soon as I take them out of the dryer. (It really doesn’t take that much time, people.) However, I wouldn’t be human if I didn’t confess that from time-to-time a pile of towels or socks and underwear doesn’t end up in a standoff on who’s doing the folding. **Special vacation note: One week before vacation departure, I declare anything to be packed may not be worn. This gives me several days to make sure everyone has what he or she wants ready to go! How do you tackle the laundry monster?